Stampgram's Studio: Happy Birthday, Quincy! 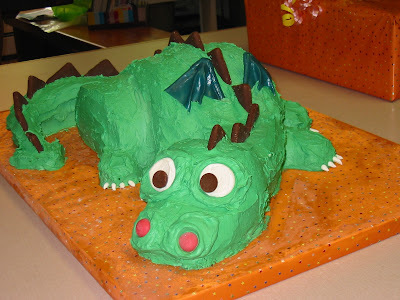 My granddaughter Quincy had her 13th birthday this week, and since she is a huge Harry Potter fan, we (her mom and I) made her a DRAGON cake. We think it turned out pretty good for a couple of amateurs! 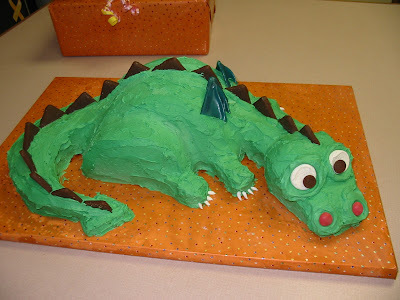 We used three cake mixes and 3 1/2 tubs of frosting -- not to mention ooh so much green food coloring. It has chocolate grahams for its spikes, slices of large marshmellows and giant chocolate chips for eyes, snips of marshmellow for claws, raspberry M&Ms for nostrils, and the wings are made from blue fruit roll-ups, held up by skewers. It was very large when we finished but a big hit at her party. At the party one of Quincy's friends was so cute; she said, "Mmmm, I have never eaten a dragon before but it is really quite tasty -- much sweeter than you might think." We all had a laugh over that. What a fun day! WOW!!! what a wonderful cake, you guys did an excellent job!